It is now more than five years since my first visit to Papua New Guinea and Reite village, on Madang Province’s Rai Coast. I’ve just completed my fourth field trip there with anthropologist, James Leach, where we have been conducting the first stage of a 2 year legacy and handover phase for TK Reite Notebooks, supported again by The Christensen Fund. Our aim is to establish a firm base for Reite people to have control over the tools and techniques we have co-developed with them, and for them to have both the confidence, capability and capacity to share not only their own Traditional Knowledge with others, but to train other communities, who wish to adopt it, in the TKRN Toolkit‘s use too. Over the years we have been exploring potential partnerships with local organisations both in PNG and in Vanuatu, hoping to build a network of support for TKRN and those using it. Last year James met with Banak Gamui of the Karawari Cave Arts Fund – an NGO based in Madang – who is active in supporting traditional cultural preservation and regeneration initiatives in Madang Province, including the Madang-Maror Network. Banak agreed to help support Reite people continue to use the Toolkit beyond the project’s end, by hosting the basic publishing kit (laptop, printer & scanner) at KCAF’s office and strengthening Reite’s connections with other communities in the area also active in practising, documenting and preserving Kastom culture. 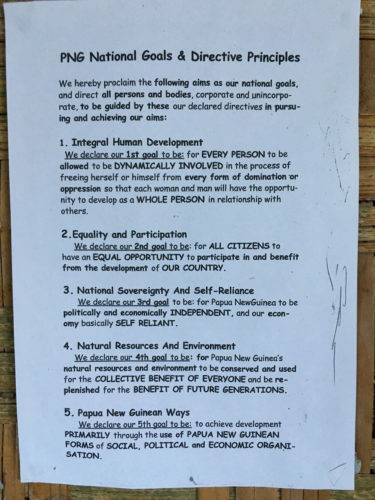 In addition, Yat Paol, of Gildipasi/Madang-Maror, was also able to broker a connection with Bismarck Ramu Group, another local NGO which supports communities retain their land and water rights against extractive development. 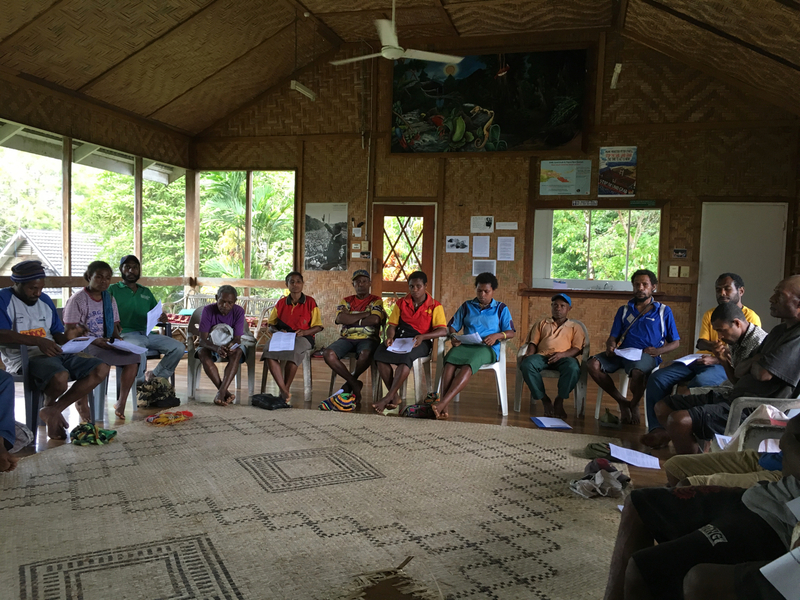 BRG agreed to host a 3 day workshop and 18 participants from Reite and its neighbouring villages, Marpungae, Asang, Soriang and Sarangama, travelled up to Madang to take part, along with Banak Gamui, Yat Paol and Catherine Sparks – formerly Melanesia Program Officer of The Christensen Fund. Over these days, we increased the core group we had been working with from the village and undertook refresher training in making and using the notebooks co-developed previously. Much time was also spent in discussions about what exactly TK (Traditional Knowledge) means to people for whom it is still an everyday practice – rather than a ‘heritage’ practice as many Western traditions are often relegated to. One of our key Reite collaborators, Urufaf Anip of Marpungae, came up with a popular transliteration – Timbuna Kastom – which seems to capture much of what is both special and at risk about their way of life. Timbuna could be understood as the ancestor spirits which animate the bush, as well as descendants and those to come. Kastom is the traditional way of life that communities in PNG followed for countless generations before the arrival of missionaries and colonialism. 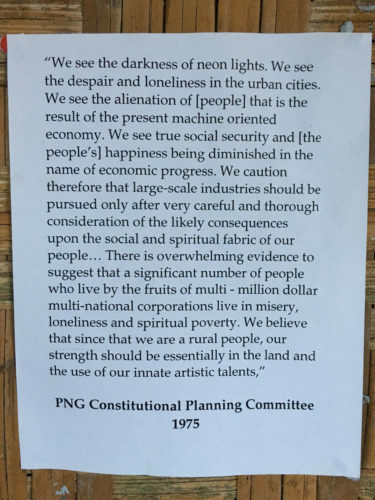 As both Christianity, the money economy and industrial development (mining, logging, monocultural farming, factory fishing and other extractive processes) have supplanted traditional beliefs and ways of living, so more and more Papuans have found their connection to land, bush and water have been severed, and their lives made more precarious. This connection is at the heart of what makes this project such a timely opportunity to revitalize social cohesion and knowledge transmission around the importance of those communities which have retained a strong traditional culture. 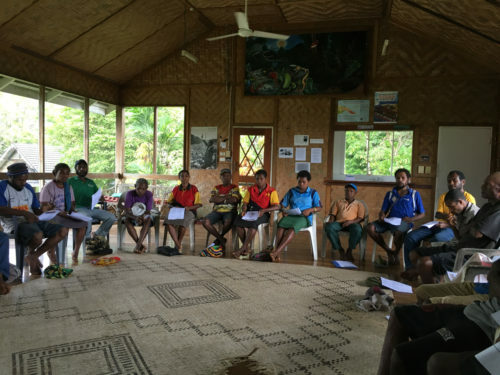 The workshops also underlined the crucial importance of Tok Ples – local language – which is the blood of Timbuna Kastom/Traditional Knowledge’s beating heart. PNG has over 800 individual languages (not dialects) – with some ranging from just a few tens to thousands of speakers. Until very recently, communities across PNG were almost exclusively oral in culture, writing and literacy being a product of interaction with traders, missionaries and then colonial administration. But there is an intensely rich visual culture – each community creating unique designs reflected in their crafting of objects and decorations as well as styles of house building. Designs are often deeply symbolic, communicating specific stories and meanings, or relating to particular locations. Language and visual design are thus deeply intertwined with the particular geographies and environments which PNG’s many and diverse communities inhabit and steward. Maintaining and strengthening this diversity is as crucial as maintaining the diversity of plants and seed banks for genetic variety. PNG’s school system still teaches predominantly in English, and over the years Pidgin, Tok Pisin, has become the main national language, to the point now where children in many communities are not being brought up to speak their local Tok Ples first, but Pisin instead. As the unique relationships to place are loosened in this way, the connection to land slackens and people are persuaded to register and sell their land to outsiders. For a country where around 80% of people are still reliant on subsistence food production (through their gardens) this is clearly catastrophic. The workshop provided us with a space and place to collectively retread the ideas and experiments of the past 5 years, and to reiterate the aspirations and ambitions for what the tools and the continued practice of kastom means to traditional communities. Being held in a less isolated and rural setting it also gave us the opportunity to demonstrate the digital aspects that are harder to achieve in the bush: scanning in notebooks and uploading to the online library which we created for Reite. Although almost all the villagers have never used a computer before, are completely unused to keyboards and have only a slim grasp of the workings of file systems and structures, windows and desktop metaphors – they acknowledge the potential benefits that this form of recording and sharing can offer them and are quick to learn it use. Two people (Urufaf and his sister Pasen) were chosen to be the leaders of this activity and to receive additional training later in our visit. The workshop had been programmed to precede and important ceremony in the village, and on its conclusion the villagers, James, myself, Banak, Catherine and Yat’s wife and son made the day-long journey in two small dinghies across Astrolabe Bay and down the Rai Coast, then up 400m above sea level and 10km inland to Reite village, where we would be staying. Over the next days a series of ceremonies and events took place that demonstrated Reite’s strong hold on kastom, the richness of their culture, and just how keenly people wish to continue this way of life into the future and for the benefits of future generations. We took part in a night-time Tamburan event (a performance of secret, sacred instruments) that began in the bush before moving into a Haus Tamburan itself. This was followed the following day by a large kastom food distribution between one village and families of another, followed the next day by a reconciliation payment ceremony and the all-night Singsing to conclude the festivities. In amongst these ceremonies, James, Banak, Catherine and I were invited to address the local school (which James and I worked with back in 2015) about our respective projects and the importance of traditional culture, tok ples and caring for the environment. The ceremonies over, we rested for a day then returned to Madang for a final couple of days intensive media training with Urufaf and Pasen. This involved introducing them both to the computer from first principles, getting them used to using it for scanning documents, file management, email and using the internet. 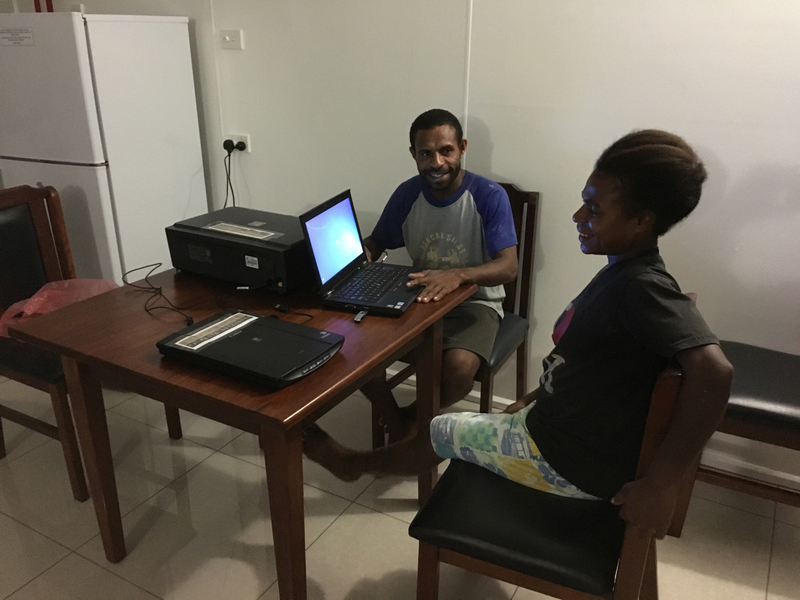 With the assistance of Banak & KCAF in Madang, and from me remotely from the UK, we will be supporting them gradually take over the maintenance of the Reite Online Library – scanning and uploading completed TKRN notebooks and expanding the resource. As their confidence and fluency with digital technologies grow, there is the potential to increase their skills to include designing their own notebooks and using bookleteer to generate their own publications. The success of the workshop at BRG and the excitement generated in the village during the ceremonies, has had a significant effect in making the longer term aspirations of the project begin to see light. Reite people are growing in confidence and desire to share this method of practicing and documenting culture and kastom to other interested communities in the region and, in so doing, to establish a name and reputation for themselves. 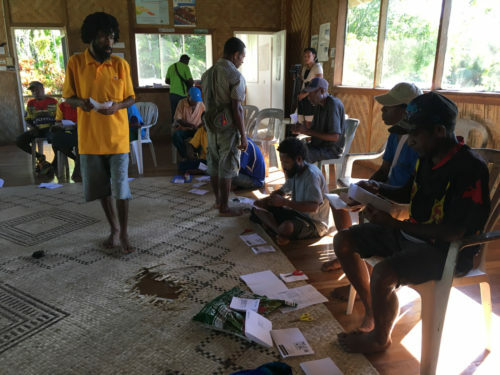 Plans are already underway for a Reite to host a group of representatives from other Madang Province communities next year to demonstrate this and share the TKRN Toolkit and training.